An improved strain of Prizewinner with extremely long and slender pods of excellent flavour, and ideal too for the village show. RHS Award of Garden Merit winner. This runner bean has been trialled, tested and recommended by the National Institute of Agricultural Botany. Matures 12-16 weeks from sowing. Recommended for deep freezing, and for exhibition. Giant pods of prize winning proportions! Any good garden soil will do, but the best crops are obtained after deep digging and liberal manuring. For early crops sow in pots under cover in April and plants out mid May, protecting against frost. Alternatively sow outdoors from April onwards, protecting early crops with cloches until frost danger is past. Sow 5-7.5cm (2-3") deep and 15cm (6") apart in double rows 30cm (12") apart. Allow 1.5m (5') between each double row. Thin resulting plants to grow on about 30cm (12") apart. Stake the plants as soon as possible after germination. Harvest August-mid October. Plants reach a height of 1.8-2.1m (6-7'). Double row 4.5m (15'), except where stated. 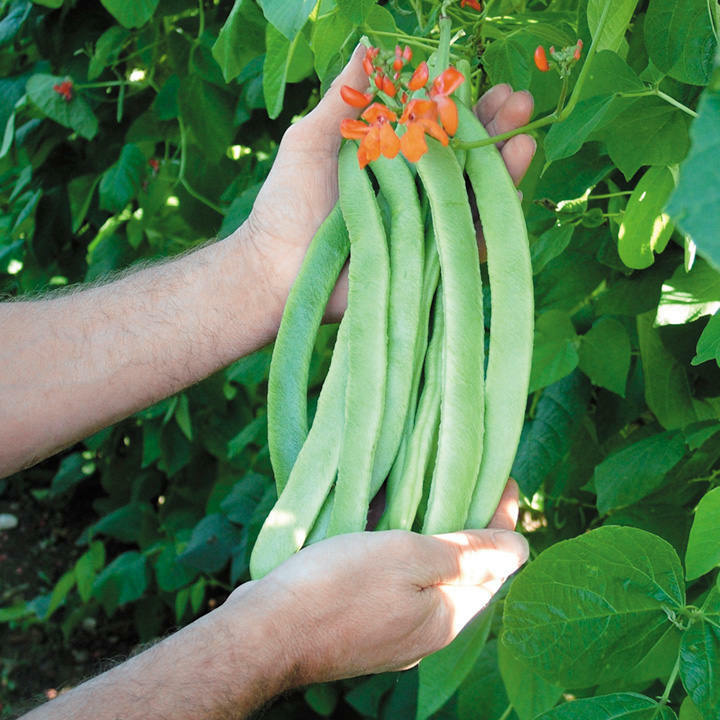 New research indicates that evening watering of the roots increases cropping and pod set. HEALTH BENEFITS: Good quantities of vitamin C (anti-ageing, wound healing, decreasing blood cholesterol and prevention of infections. Assists the body in absorbing iron), folate and iron together with fibre. COOKING HINTS: Cook thinly and steam for just five minutes (or boil for three) as vitamins are easily lost.